Public education is free for citizens up to university level and compulsory for students aged 6-12. Non-UAE nationals may attend government schools as fee-paying students. Government schools, including universities, are gender-segregated, but there are some co-educational private institutions. The UAE formal school education system was established in the 1970s. More recently, reforms have been influenced by foreign English language education systems, and the upgrading of English language skills and use of computer technology are government priorities, as the traditional school education in the UAE had been based on Arabic and Islamic culture and teacher-centred learning methods. The Ministry of Education has adopted an educational development strategy called ‘Education 2020’, based on successive 5-year plans. A new science and mathematics programme was introduced into government primary schools in 2004 as part of this strategy. Higher education institutions include both public and private Universities and Colleges. Government institutions are overseen by the Ministry of Higher Education & Scientific Research, and are only open to UAE nationals. United Arab Emirates University (UAEU), Higher Colleges of Technology (HCT) and Zayed University (ZU). Private universities and colleges are open to all students. They are licensed by the Commission for Academic Accreditation, operating within the Ministry, which also accredits their programs. The Abu Dhabi Department of Education and Knowledge (ADEK) was established to sustain Abu Dhabi’s leading position as a socio-economic hub, nurturing future leaders through cutting-edge education curriculum incorporating high quality learning outcomes, while promoting a culture of creativity, sustainability and excellence. The language of instruction in Government schools is Arabic, with English used for some science and technical subjects. Improving English language skills at all levels of education is a government priority under the ‘Education 2020’ plan, and a new English language syllabus is in the process of being introduced to all government schools. English is the primary language of instruction at the United Arab Emirates University, Zayed University and the Higher Colleges of Technology but students are expected to be fluent in both Arabic and English. A spot about the emotional and intelligent use of the Arabic language, a spot that underlines the rebuilt trust in the educational system. The school year runs from September to June, with a break from the middle of June to the end of August. All government schools, government universities and government colleges have adopted an academic calendar, which has two yearly breaks, in mid-December and end of March. The Ministry of Education is responsible for all levels of government schooling, as well as supervision of the private sector. Private schools at all levels must be licensed by the Ministry and their programmes accredited. They must also offer core programmes such as Islamic education, social studies and Arabic language. Education at primary and secondary level is universal and compulsory up to ninth grade. This takes place in a four-tier process over 14 years: 4 to 5 year-olds attend kindergarten, 6 to 11 year-olds attend primary schools, the preparatory stage caters for children aged between 12 to 14 years, and 15 to 17 year-olds attend secondary schools. The emiratisation of teaching staff in government schools is scheduled to reach 90 per cent by 2020, in order to ensure that the Islamic principles and traditions of the UAE are maintained. Over 40 per cent of pupils attend private schools. Some of these offer foreign language education geared towards expatriate communities, usually preserving the culture and following the curriculum of the students’ countries of origin. Primary school education is compulsory for all UAE citizens. Government policy is to provide staff/student ratios of 1:20 at kindergarten and primary levels; and 1:15 at intermediate and secondary levels. The existing staff/student ratios are well within this proposed range. The Primary education curriculum emphasises basic literacy and numeracy skills, and includes basic instruction in language, mathematics, and sciences. The Secondary cycle focuses on preparing students for University, technical or vocation training, or for the joining the workforce directly. Most students in the UAE tend to pursue higher education at universities rather than at technical or vocational institutes. The Ministry of Education is constantly honing its educational strategy to ensure that the programmes developed in its schools comply with international standards, with particular focus on introducing the latest IT resources at all levels. For example, one of the goals is to provide a computer for every ten children in kindergarten, every five pupils in primary schools, every two students in preparatory schools and one computer per student in universities. That IT education in the formative years has become a major priority for the UAE is underlined by the success of the Sheikh Mohammed bin Rashid IT Education Project (ITEP), which was launched in 2000. As well as installing computer labs in all participating schools, and creating a comprehensive cutting-edge curriculum, ITEP provided an invaluable online educational resource. ITEP now provides courses in 40 high schools in the UAE (20 in Dubai, 20 in Abu Dhabi) and over 13,000 students pass through the program every year. ITEP’s trainee pupils achieved 97 per cent success rate in courses in the 2005/06 academic year. Secondary education lasts for three years. It consists of a common first year followed by specialization in Science or Arts. At the end of the twelfth year, students take the examination for the Shahadat Al-Thanawiya Al-Amma (Secondary School Leaving Certificate). Technical secondary education offers both preparatory and secondary cycles. The preparatory cycle offers an Engineering course for the acquisition of basic skills leading to the Intermediate Certificate. At the end of the secondary cycle, a Technical Secondary Diploma is awarded. National Admissions and Placement Office (NAPO): co-ordinates admissions to public higher education institutions. The Common Educational Proficiency Assessment (CEPA) is a joint venture between three higher education institutions in the United Arab Emirates. The three higher education institutions are the United Arab Emirates University (UAEU), Higher Colleges of Technology (HCT) and Zayed University (ZU). These institutions are supervised by the National Admissions and Placement Office (NAPO) in the Ministry of Education – Higher Education to deliver this test throughout the UAE for all 12 year grade students seeking higher education in the UAE. The UAE has established an excellent and diversified system of higher education in a very short period of time. Nationals can attend government institutions free of charge, and a wide range of private institutions, many with international accreditation, supplement the public sector. The country now has one of the highest application participation rates in the world. Ninety-five per cent of all females and 80 per cent of all males who are enrolled in the final year of secondary school apply for admission to a higher education institution or to study abroad. The Al Ain-based United Arab Emirates University (UAEU), which opened in the academic year 1977/78, continues to be the country’s flagship national institution of higher education and is committed to its role as the leading teaching and research institution in the UAE. UAEU offers over 70 undergraduate bachelor degrees and a number of graduate programmes in a wide range of disciplines. International accreditation has been awarded to the professional academic programmes and the non-professional programmes undergo periodic external evaluation by international experts to ensure that they meet international standards. Collaboration with international institutions also opens up new opportunities for UAEU’s students. 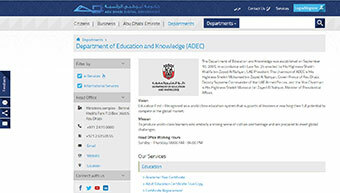 A system of UAE colleges offering a more technically oriented education was devised in 1988. The Higher Colleges of Technology (HCTs) began with an enrolment of 239 students. Today, 16 men’s and women’s colleges in Abu Dhabi, Al Ain, Madinat Zayed, Al Ruwais, Dubai, Ra’s al-Khaimah, Sharjah and Fujairah provide a diversity of programmes to over 19,000 students in modern, technologically equipped campuses. Everything from assignments and mark sheets to missed classes and the library is online and can be accessed by each of the 2000 students and 300 faculty members at any point in time. The HCT and its commercial arm, The Centre of Excellence for Applied Research and Training (CERT), through a number of strategic alliances with multinational business organisations and prestigious international training institutions, pride themselves on responding quickly and effectively to current needs in the regional and international work place, providing professional development and lifelong learning opportunities for the UAE, the Gulf region, and – through online training courses – to many other parts of the business world. CERT, which was founded in 1997 and is now the largest private education provider in the region, has also been at the forefront of providing specialised customised training, promoting entrepreneurship and creativity, and facilitating technological advance through its technology park. CERT is collaborating in applied research with industry leaders such as Intel, Microsoft and IBM, and in 2006 it will become the first organisation in the region to offer supercomputing power through its acquisition of the IBM Blue Gene, the fastest computing platform in the world. CERT’s clients are large public and private sector organisations in the region, including the UAE Military, and the Presidential Court. Zayed University (ZU) was established in 1998 by the Federal Government to educate UAE national women. Both ZU campuses in Abu Dhabi and Dubai are governed by a single administration and offer similar programmes. ZU’s Dubai campus relocated to the Academic City complex in the Al Ruwayyah area in 2006. This Dh370 million facility encompasses a total area of 711,000 square metres comprising six colleges, departments and laboratories. ZU is organised academically into five colleges: Arts and Sciences, Business Sciences, Communication and Media Sciences, Education, and Information Systems. The primary language of instruction is English, but the University expects its graduates to be fully bilingual in English and Arabic, proficient in the use of information technology, and strong in quantitative and research skills. ZU is currently engaged in cooperative relationships with a number of leading institutions throughout the world. In 2011 Zayed University will be opening a new campus for up to 6,000 students in the new Khalifa City, Abu Dhabi. Covering an area of 213,000 m2, this will be a state-of-the-art academic and research facility with scientific laboratories, classrooms, computer labs, a library of over 18,000 m2, a cafeteria as well as a sports complex and conference center. Many excellent private institutions offer a wide range of tertiary-level opportunities. Notable institutions include the Americian University of Dubai, American University of Sharjah, Heriot-Watt University, University of Wollagong, Sharjah University and the Ajman University of Science and Technology. The Ministry of Higher Education and Scientific Research is responsible for the accreditation of institutes and degrees and the MoHE provides a comprehensive list of recognised institutes and programmes. Quotas: Some 8% of total places are reserved for students from the Arab Gulf region and 7% for other foreigners. Students should hold a General Secondary School Certificate. Gulf students should obtain 60% of total marks in the high school Certificate for admission to the Faculties of Engineering and Economics; non-Gulf students should obtain 80% for admission to any faculty, except Engineering where they must obtain 90%. For Islamic Studies and Sharia, candidates must be Muslims and must obtain 50% of the total marks in the High School Certificate. Applications should be made to the University in June. Handicapped centres supervised by the Ministry of Labour and Social Affairs cater to those with hearing and physical disabilities, the visually impaired and others with special needs. The Ministry is constantly improving its facilities, at the same time emphasising the role of the family in caring for the disabled. The percentage of disabled people in the UAE is similar to the worldwide average, i.e. 8–10 per cent of the population. Some major new developments are under way, including a large centre in Abu Dhabi with 70 classrooms and 20 training workshops and the Al Thiqah Club For Handicapped (+971 6 538 9999) which opened in Sharjah. The Ministry of Education and Youth, together with the Red Crescent Society, also opened a Centre for Autistic Children in Abu Dhabi (+971 2 582 1621), the first in a number of such centres planned by the Ministry.